Offering thorough MOTs, our staff provide helpful advice and guidance whenever you need it. 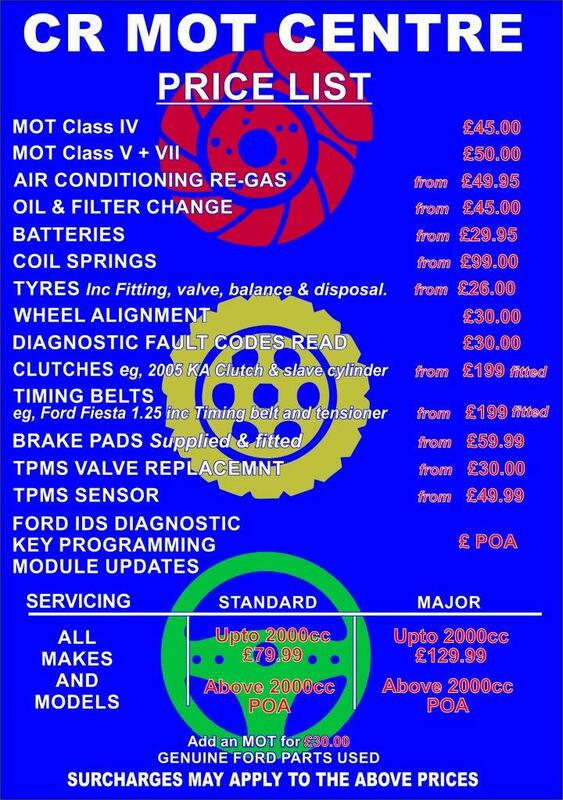 We also provide comprehensive servicing on all makes and models of vehicle. As a company you can trust, we provide a huge range of budget tyres. Make the most of your vehicle’s facilities by ensuring that the air conditioning system is working correctly. Our technicians also work on batteries so you can pop in to see us if you have any concerns regarding maintenance or a replacement. Using state-of-the-art Snap-On™ diagnostic equipment compatible with all makes and models, we make sure that your vehicle is free from faults. It is also important that your brakes are checked regularly as well as your clutch and timing belt. Our team of technicians at CR MOT Centre Ltd go the extra mile for you and your car. Based in Tamworth, Staffordshire, our full range of garage services includes car MOT checks, servicing, and tyre work as well as all types of general repairs. Working on both domestic and commercial vehicles, we boast more than 110 years of combined experience as a dedicated team of experts. Contact us in Tamworth, Staffordshire, for more information about our garage services including car MOT checks. Please feel free to have a look around our website and keep checking back for the latest updates on special offers, which are updated on a regular basis. We believe that we offer the most affordable prices in Tamworth and guarantee to beat any genuine like-for-like quote to save you both time and money. As part of our comprehensive service, we offer a convenient and complimentary collection and delivery service, within the Tamworth area. Vehicles can also be left on-site throughout the day if it is more convenient for the customer to leave and return for collection later. Our family-run business CR MOT Centre Ltd was set up in 2013, with the core objective of providing a trustworthy garage where the customer comes first. From the very beginning, we have always worked in close relation with customers old and new to provide a service tailored to their needs. By listening to specific issues and requirements, we are able to provide a swift diagnosis in order to get you back on the road as soon as possible, while doing everything we can to keep your costs to a minimum. We never compromise on providing an exceptional standard of work at all times, by using high-quality parts as part of our impeccable customer service. 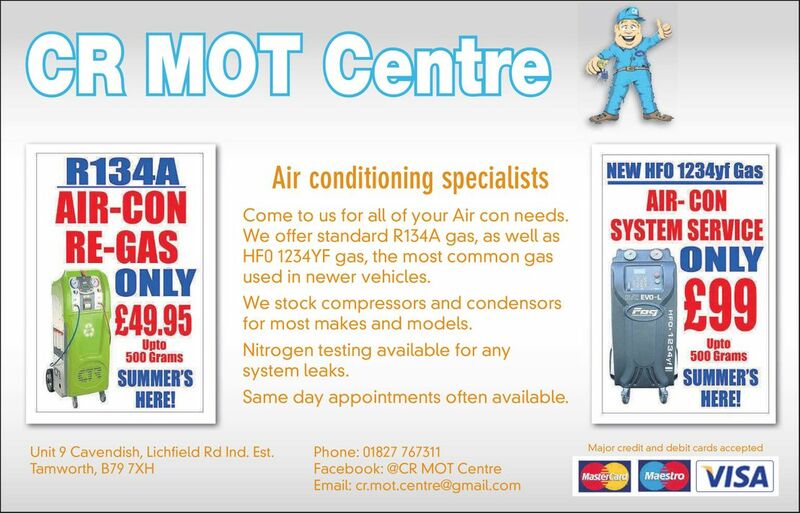 Find us on Facebook at CR MOT Centre and 'Like' us to keep up to date with regular offers and giveaways.